The Teenage Mutant Ninja Turtles return to the big screen as never before in an all-new CGI action adventure, written and directed by Kevin Munroe. After the defeat of their old arch nemesis, The Shredder, the Turtles have grown apart as a family. Struggling to keep them together, their rat sensei, Splinter (Mako), becomes worried when strange things begin to brew in New York City. Tech-industrialist Maximillian J. Winters (Patrick Stewart) is raising up an army of ancient monsters, and only one super-ninja fighting team can stop them - Leonardo (James Arnold Taylor), Michelangelo (Mikey Kelley), Donatello (Mitchell Whitfield) and Raphael (Nolan North)! With the help of old allies April O'Neil (Sarah Michelle Gellar) and Casey Jones (Chris Evans), the Turtles are in for the fight of their lives as they once again must face the mysterious Foot Clan, who have put their own ninja skills behind Winters' endeavors. $24.255 million on -unknown- screens. How depressing is it to realize it’s been almost 20 years since the release of the first Teenage Mutant Ninja Turtles movie? Pretty depressing, though at 40, most age-related subjects make me mopey. Damn my aging hide! In any case, 2007’s TMNT serves to kick start that long dormant franchise. Narration by Laurence Fishburne offers only a cursory reintroduction to the turtles. We hear that brothers Donatello (voiced by Mitchell Whitfield), Leonardo (James Arnold Taylor), Michelangelo (Mikey Kelley) and Raphael (Nolan North) mutated from ordinary turtles in the sewers of New York, received training as ninjas, and defeated their arch-nemesis Shredder. Now, however, an ancient evil threatens to destroy them. And what evil would that be? 3000 years ago, a warrior king named Yoatl did his best to rule the world. He discovered that a rare alignment of stars opens to world of immeasurable power. Yoatl took advantage of that and became immortal, but it destroyed his brotherhood and released 13 monsters into our existence. This left him doomed to walk the earth as a lonely screw-up, stuck with the memories of his goof and the knowledge that those 13 beasties would continue to plague the earth. After this long prologue, we come to present day and find out what’s up with the Turtles. Since we last saw them, they’ve gone their separate ways, though not with much success as solo acts. Down in Central America on business, Turtle pal April O’Neil (Sarah Michelle Gellar) finds Leo in semi-exile. After hearing about his brothers, he eventually decides to return home. Why was April in Central America? She went to retrieve a stone soldier statue for collector Mr. Winters (Patrick Stewart). The wealthy Winters also recruits the assistance of the evil Foot Clan to help “greet” some nasty friends who will come to town. That’d be those 13 monsters, of course, and the statues are Yoatl’s old warriors. All of these elements combine to create a lot of threats in the Big Apple – and ample reason for the Turtles to reunite and do their thing. Boy, is that a dense set-up to the tale! Essentially you can take that whole synopsis and throw most of it out the window. It exists as a long lead-in to little more than a bunch of battle scenes. And there’s nothing particularly wrong with that, though the dense nature of the plot seems potentially off-putting for the film’s target audience. Many adults will find it tough to figure out the whos, whys and wherefores of this complicated tale, so I expect the kiddies will become completely befuddled. Or maybe they’re better equipped to deal with the confusion, since they won’t try to make sense of it. Adults feel they need to work out the kinks in the narrative, whereas kids will just dig into the action and feel happy with that. I’m not sure how well TMNT will satisfy any of its audiences. I think the film’s opening concept is a mistake. After all these years away from the big screen, it would’ve made more sense to relaunch the franchise with a little more origin exposition. That’d let us get a better grasp for the characters and situations. Sure, we can figure out the dynamics reasonably well anyway, but a little more definition would’ve been nice. That said, I think the intro to the Turtles actually sets them up efficiently. We quickly can identify the Smart One, the Tough One, the Goofy One and the Leader. Do we need more than that? Probably not, though I’d sure like more than that, and it’d be nice to know more about April and their other cohorts. I really do think the dense plot creates problems. If TMNT stuck with a less complex tale, it’d probably feel more satisfying. It boasts the components to create a fun movie, and when it indulges in basic action or the amusing quirks of its main characters, it does pretty well for itself. The various monsters offer interesting adversaries, and the natural weirdness of the Turtles themselves remains entertaining. They were created as a wacky reaction to standard superheroes, and that tone keeps them fresh. If only they could work while less encumbered by plot restrictions. Every time that it looks like the movie will break free of its burdens, we go back to the over-thought-out story. Those moments disrupt the film’s natural flow and make it clunky. Speaking of “clunky”, that’s the best term to use to describe the computer animation of TMNT. Don’t expect Pixar-quality work here. Character and environmental rendering look very good, but the participants move in an awkward, jerky manner much of the time. Sure, it’s a step up from the dudes in costumes found in the earlier movie, but the animation doesn’t live up to modern expectations. Despite its up and down nature, I think TMNT has enough fun to make it watchable. It provides a lot of good action and some humor, both of which help compensate for its excessively dense plot and its unnatural animation. The film could be better, but it manages to create decent entertainment. 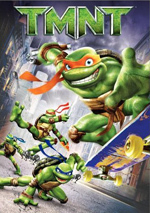 TMNT appears in both an aspect ratio of approximately 2.35:1 and in a fullscreen version on this double-sided, single-layered DVD; the widescreen image has been enhanced for 16X9 televisions. Only the letterboxed picture was reviewed for this article. Though usually excellent, the picture was a little less consistent than I’d like. My only minor concerns related to sharpness. For the most pat, the flick seemed accurate and well-defined. However, wider shots occasionally appeared a bit soft. These issues weren’t major, but they didn’t create the expected level of rock-solid delineation I expect from CG animation. At least no jagged edges or shimmering occurred, and I noticed no edge enhancement. Source flaws also created no concerns in this clean presentation. The film’s palette went with a cool, almost sepia tone at times. The hues consistently looked fine within those parameters. The colors seemed clear and accurate throughout the flick, and when they embraced more natural tones, they were quite vivid. Blacks were also deep and dense, while shadows offered good definition. Despite some light softness, this was a strong visual presentation. As for the Dolby Digital 5.1 soundtrack of TMNT, it also worked well. The movie presented a fairly engaging soundfield. Not surprisingly, its best moments related to the mix of action scenes. These helped open up the spectrum pretty nicely. Otherwise, we got good stereo impressions from the music along with solid environmental material. The latter reverberated in the rear speakers to positive effect, and some unique action material popped up there as well. No problems with audio quality occurred. Speech was always concise and natural, and I noticed no edginess or other concerns. Music seemed bright and lively. Effects showed good distinctiveness, and they offered nice low-end when appropriate. The track wasn’t quite immersive enough to merit an “A”-level grade, but it was very pleasing nonetheless. In terms of extras, we start with an audio commentary from writer/director Kevin Munroe. He offers a running, screen-specific chat. 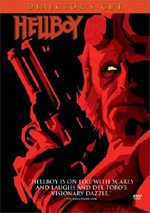 He discusses the project’s origins, characters and story issues, cast and performances, visual design and animation, various references and influences, and a mix of other production topics. Munroe sounds genuinely enthused to record his track, and that comes through from start to finish. He offers a nice balance of technical and creative elements as he talks. That means we learn a lot about the production in this interesting, lively chat. An Alternate Opening runs three minutes, while an Alternate Ending goes for one minute, 16 seconds. Both come in rough form and provide commentary from Munroe. The “Opening” gives us a little more backstory for the characters, while the “Ending” focuses more on Casey and April. I like the “Opening” but am glad they cut the “Ending”. More cut footage comes from ”Mikey’s Birthday Party” Full Sequence. This shows all three minutes, 15 seconds of that character’s intro and offers a fun piece. It might’ve been too long for the full film but it’s enjoyable to see, although I wish we could watch it without Munroe’s commentary; his notes are good, but he talks over dialogue. ”Raphael’s Rough House” Fight Test fills one minute, 40 seconds with a pre-viz version of the Leo/Raph battle. Here Munroe’s comments prove more effective, as he gives us the ins and outs of this early footage. The two-minute, 49-second Monsters Come Alive provides a film to storyboard comparison for that scene. Munroe provides more good info as we check out the original art created to plan the sequence. For Donny’s Digital Data Files, we get notes from Munroe and producer Paul Wang. This one-minute and 55-second featurette offers rudimentary info about computer animation techniques used to bring the characters to life. Some of the material is good but it’s way too brief to satisfy. Another deleted scene comes with Roof Top Workout. Presented first as storyboards and then as pre-viz, it lasts five minutes, 33 seconds. This looks like a fun scene, but again, we don’t get to hear much of the dialogue. Munroe’s commentary remains useful, but I’d like to be able to hear the lines as well. “Still Wanna Fight?” Temp/Scratch Test takes up three minutes, eight seconds with another cut scene. Despite the “temp/scratch test” disclaimer, this one actually presents fully rendered animation, which means – as Munroe tells us – that it got the boot late in the game. Once again, although Munroe offers nice insights, I hate that I can’t hear the scene without his remarks. Next comes the three-minute and 50-second TMNT Internet Reel. This essentially acts as a long promo that originally popped up on the Internet. 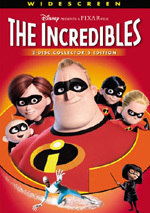 It takes various bits from the final movie and re-introduces the main characters. It’s moderately interesting as a 10-cent synopsis of the film. After this we find a featurette called TMNT Voice Talent First Look. In this five-minute piece, we get comments from Munroe, Wang, producer Thomas K. Gray, and actors Patrick Stewart, Sarah Michelle Gellar, and Laurence Fishburne. It’s a basic puff piece that recaps the story and tells us the movie will be awesome. It provides no greater depth than that. 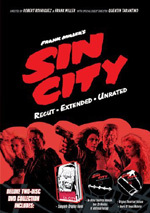 A few ads open the DVD. We get promos for Blu-Ray and HD-DVD, The Last Mimzy, GameTap, Fred Claus, TMNT: The Video Game, TMNT toys, Space Ghost and Dino Boy, Birdman and the Galaxy Trio and Droopy: The Complete Theatrical Collection. No trailer for TMNT appears. With TMNT, fans of the Teenage Mutant Ninja Turtles find their heroes in a pretty decent big-screen adventure. At no point does the movie threaten to become great, but it keeps the viewer reasonably engaged across its brief running time. The DVD offers very good picture and audio along with a few interesting supplements. This is a worthwhile purchase for Turtles fans.